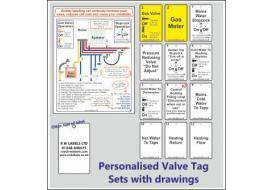 Sets of valve tags complete with a descriptive diagram for marking up plumbing and heating systems. Available to order on-line from as little as £4.79 a set. Other drawings can be made to order and supplied with the relevant labels to suit your requirements. 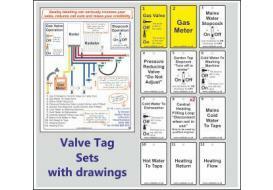 Sets of valve tags complete with a descriptive diagram for marking up plumbing and heating systems. Each valve tag is personalised on the other side with your company details and this can include an after sales or customer services number. Available from as little as £7.80 a set.